all items will be mailed out usps 1st class. Buyer pays all shipping costs. Priority mail is available upon buyers request. All items will be mailed out within 2 days of cleared payment. Hi everyone thank you for visiting my shop. Are you looking for hats, shawls, scarves, neck warmers, cuffs, beanies, newsboys, berets, cloches, flapper style hats, slouchy tams, sarongs or wraps... here they all are and so much more! 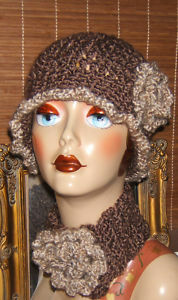 Each item is designed, hand-crocheted & made by me vym7777. Each and every item is made with lots of tender love and care. All of my items are from a smoke and pet free environment. I accept CUSTOM orders and if you are interested in WHOLESALE orders please contact me. Looking for a certain item, just ask and I will try my best to make what you are looking for!